At roughly 300 miles from sea level to the top of the thermosphere, the bulk of Earth’s atmosphere is relatively thin compared to the 8,000-mile diameter of our planet. At the very top of the atmosphere is the exosphere, which is usually considered as the lower boundary of interplanetary space. The exosphere is a relatively mysterious place, at least compared to the lower layers of our atmosphere. 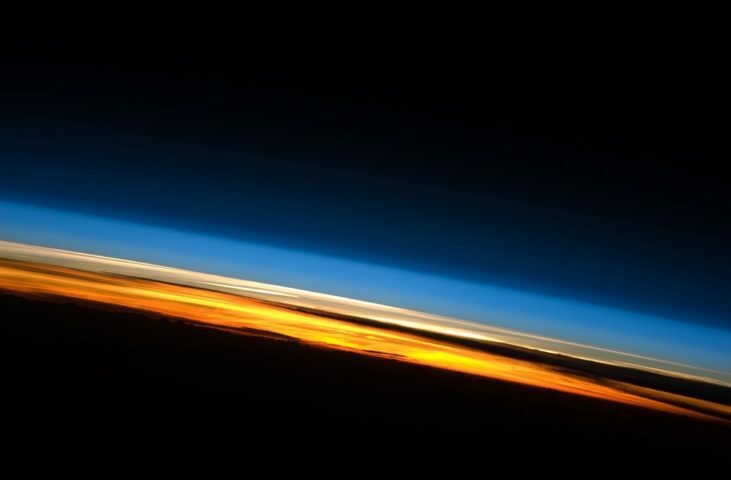 Considering that we live in the troposphere, and that 3 other atmospheric layers divide us from the exosphere (the stratosphere, mesosphere, and thermosphere, in that order), we are far removed indeed from the top of the atmosphere. However, thanks to technology such as satellites, scientists have learned a lot about the upper reaches of the atmosphere. Exosphere is a Greek word that literally means outside (or external) sphere. If we were to compare the distance from sea level to the base of the exosphere to that of two points on a car trip, then driving from sea level to the base of the exosphere (300 miles up, though this varies based on the amount of solar activity and ranges up to 600 miles high) would be equivalent to driving from Philadelphia to Boston. The top of the exosphere is generally marked at 6,200 miles above sea level. Put another way, that is the same distance as a round trip from Boston to San Francisco. As the outermost layer of our atmosphere, the exosphere is where a lot of space weather happens and is our first line of defense against cosmic rays, earthbound meteors, and asteroid impact, among other types of sky events. The exosphere primarily contains hydrogen and helium, which are the lightest gases and found in relatively small quantities in the exosphere. There are also traces of carbon dioxide and atomic oxygen. There is so little density of particles in the exosphere that it can be difficult to determine where exactly the exosphere actually ends and outer space begins. While many particles that ascend to the exosphere are pulled back to lower levels of the atmosphere by Earth’s gravity, some air atoms and molecules manage to escape into space, yet they are so few and far apart that they rarely ever collide with each other. Because the air in the exosphere is extremely thin, temperatures range quite drastically. Generally, the exosphere on the daytime side of the Earth can exceed 1,000 degrees, while things are far cooler on the nighttime side – only a few degrees above absolute 0. It is in the exosphere that satellites orbit; in this environment, there is very little friction as compared to lower levels of the atmosphere, meaning it is the perfect place for equipment such as satellites to orbit with minimal disruption from molecular interference. Some scientists actually consider the exosphere as part of outer space, as there is such a gradual and fuzzy distinction between the density of molecules in the very upper reaches of the atmosphere and lower reaches of space. In the most technical sense, the upper limit of the exosphere is the last point at which Earth’s gravity still has any influence on particles. Using this definition, the upper exospheric boundary could be as high as 120,000 miles – which is halfway to the Moon.